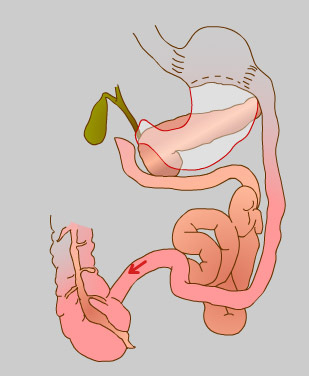 This operation combines removal or exclusion of 2/3rds of the stomach along with a long intestinal bypass which significantly reduces the absorption of fat. The capacity to eat is greater than with the other operations, and the eventual weight loss is the best of all the operations but if fatty foods are overeaten e.g. a hamburger and fries then diarrhoea and foul flatus will result. Greater stomach capacity (200-250 mls) therefore can eat a small main meal instead of an entrée portion. Adjustable and partially reversible, but only by further surgery. A very good option for revision if other techniques have failed. Malabsorbtion to some minerals vitamins and Protein . Patients must commit to taking lifelong supplements of the fat soluble vitamins ( A D E K ) Calcium and sometimes Iron. Residual stomach capacity 200mls and Estimated weight loss is 70-90%EWL at 2 years.